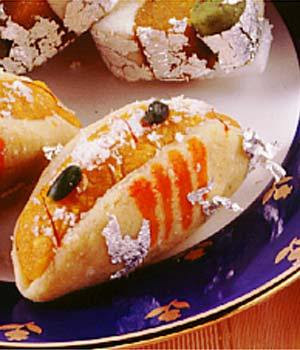 Discription:Almond taco shells stuffed with a cashew filling. A sweet version of the famed Mexican tacos. Soak the almonds in warm water for about 30 minutes. Drain all the water, peel the almonds and blend them to a fine paste in food processor. Dissolve the sugar in 1/2 cup of water and prepare a syrup of 1 string consistency. Add the almond paste and cardamom powder and cook over a slow flame, stirring continuously till the mixture leaves the sides of the pan (approx. 5 to 7 minutes). Transfer to a plate and cool slightly. Keep aside. Soak the cashewnuts in warm water for about 30 minutes and wash them 2 to 3 times. Drain all the water out and blend the cashewnuts to a fine paste. Keep aside. Dissolve the sugar in 1/2 cup of water and prepare a syrup of one string consistency. Add the cashew paste and cook over a medium flame, stirring continuously till the mixture leaves the sides of the pan (approx. 5 to 7 minutes). Make the badam barfi and cahew barfi as mentioned in the respective recipes. Divide the badam barfi into 8 equal portions and roll out each portion between 2 sheets of plastic into circles of 100 mm. (4″) diameter. Keep aside. Add the broken cashewnuts and yellow food colouring to the cahshew barfi and mix well. Divide into 8 equal portions and shape each portion into a cylinder 100 mm. (4″) long and 25 mm. (1″) thickness. Place one cashew barfi cylinder in the centre of the badam barfi circle and fold over to form a semi circle like a taco. Repeat for the remaining ingredients to make 7 more tacos. Garnish with slivered pistachios and saffron and serve.